The 50/50 Collection is a truly iconic celebration of TONI&GUY's past 50 years of inspirational, trend-defining, fashion-led hairdressing that has changed the face of the industry forever, while the collection also looks firmly into the future with an eclectic mix of inspirations from the TONI&GUY International Artistic Team, who worked to create 10 definitive cut and colour techniques for 2013/14. 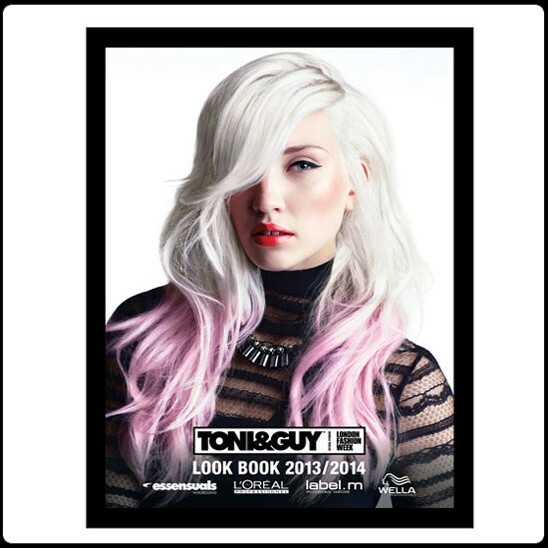 The 50/50 Collection pays homage to TONI&GUY's illustrious legacy of creating beautiful hair, that has seen the brand being awarded both a 'Coolbrand' and 'Superbrand' status simultaneously to mark the brand's milestone anniversary. Each of the 10 looks symbolises past successes for the brand, referencing historic TONI&GUY Collections, while also taking inspiration from current fashion trends to create a seamless merging of past, present and future, creating a high-fashion, relevant collection, synonymous with the brand. The ultimate 'accessory' of any cut, the 50/50 Collection doesn't shy away from colour, with a palette that ranges from flaming reds, vanilla blondes, to royal blue and violet hues. Through a variety of skillful techniques from colour blocking, root stetching, colour flashes to surface shading, colour accents are artfully placed to perfectly complement the cut. The 50/50 Collection is a truly iconic celebration of TONI&GUY's past 50 years of inspirational, trend-defining, fashion-led hairdressing that has changed the face of the industry forever, while the collection also looks firmly into the future with an eclectic mix of inspirations from the TONI&GUY International Artistic Team, who worked to create 10 definitive cut and colour techniques for 2013/14. The 50/50 Collection pays homage to TONI&GUY's illustrious legacy of creating beautiful hair, that has seen the brand being awarded both a 'Coolbrand' and 'Superbrand' status simultaneously to mark the brand's milestone anniversary. Each of the 10 looks symbolises past successes for the brand, referencing historic TONI&GUY Collections, while also taking inspiration from current fashion trends to create a seamless merging of past, present and future, creating a high-fashion, relevant collection, synonymous with the brand. The ultimate 'accessory' of any cut, the 50/50 Collection doesn't shy away from colour, with a palette that ranges from flaming reds, vanilla blondes, to royal blue and violet hues. Through a variety of skillful techniques from colour blocking, root stetching, colour flashes to surface shading, colour accents are artfully placed to perfectly complement the cut.